This World Humanitarian Day, the United Nations is working to showcase the devastation faced by millions of civilians, whose lives have been destroyed by war. This includes humanitarian workers like doctors and nurses who are on the frontlines of conflict zones and are targeted by attacks. The UN Office for the Coordination of Humanitarian Affairs (OCHA) and its partners are urging people around the world to declare that women, children, families, health workers, the elderly, the disabled and all civilians caught up in conflict are #NotATarget. 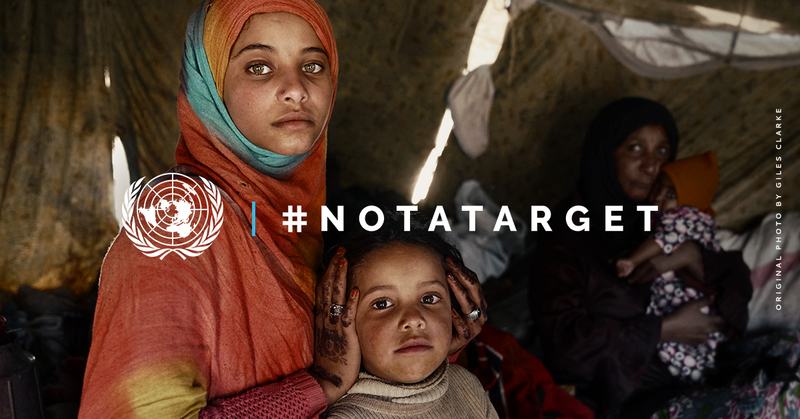 #NotATarget, a campaign launched by UN Office for the Coordination of Humanitarian Affairs (OCHA) and its partners, demands that world leaders take action to protect all civilians caught in conflict zones. Together, the world must ensure that civilians and humanitarian aid workers are able to safely assist those in need. From people in cities struggling to find safe shelter and resources to refugees crossing the sea in search of the same, we must acknowledge and support all affected. This year, OCHA is launching the world’s first living petition, to confront world leaders at the UN General Assembly with a powerful reminder: civilians are #NotATarget. There is a wide variety of people affected by conflict. Each faces their own unique set of challenges, and require policy tailored to their needs. There are over 68 million people fleeing war, violence, and persecution. Forced from their homes, these people are seeking the basic means to survive while many of their counterparts are still trapped in towns and cities, struggling to escape violence. With little hope of returning home, these civilians are traveling across land and sea in search of safety. However, displacement raises new challenges. These refugees are at higher risk for sexual violence, arbitrary arrest and detention, forced recruitment, and trafficking. In response to war, comes many compelled to help. 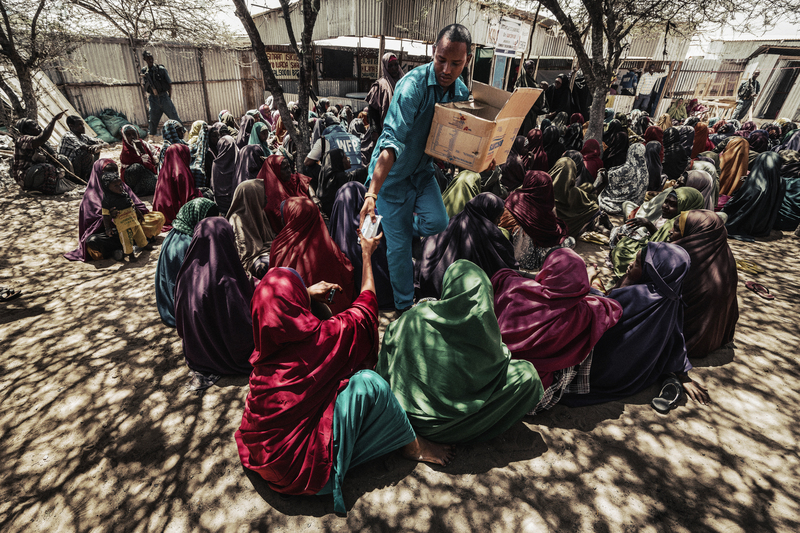 Aid works uproot their own lives to provide life-saving support in areas of conflict. They choose to leave the safety of their homes to assist and attempt to bring shreds of peace alongside. These efforts are often impeded by warring parties. Aid workers are the targets of looting, kidnapping, and obstruction of supply delivery often through violent means. These impediments to humanitarian efforts create a ripple effect and cause more instability in already treacherous conditions. No matter the type of disaster or conflict, there is always a dire need for medical support. People who already face violence, are more likely to be in poor health conditions and thus medical workers are often the only hope for a population. These healthcare professions are often targeted, attacked, and forced to flee due to the hostile conditions created during a conflict. This leaves a permanent lack of essential medical care in the region, further destabilizing it. Explosives devastate during a conflict. This results in the destruction of homes, schools, hospitals, and basic foundations of infrastructure. This lack of resources and safety often leads to catastrophic outcomes. Children in conflict, have little to no protection. The safety provided by family, school, and communities are often missing which results in basic necessities such as water becoming unattainable. These children are then easily manipulated and recruiting into fighting, sexual trafficking, and other dangers. This can also result in a continued cycle of violence. Sign the world’s first, living petition. Take a selfie in support of the #NotATarget campaign.